Here is another tool we (actually me) like to use at Yanado. Personally, I use scheduled email sending when I know the email reading habits of the receiver (an investor or a client) so I can send it at the time they open their email client. In that way, chances for my email to be on the top of his inbox are huge. Here is how I used it the last time: it’s 2 a.m. I’ve just wrapped up an evening spent on pitchdeck preparing something for an investor. I need him to get that email asap and to have a response within a day. I’ve managed to finish the pitch, but I can’t very well send the investor an email at 2 a.m. when it’s highly questionable whether he’ll be there to open it and until he is able to read my email, it will be buried under 100s emails he receives every morning. 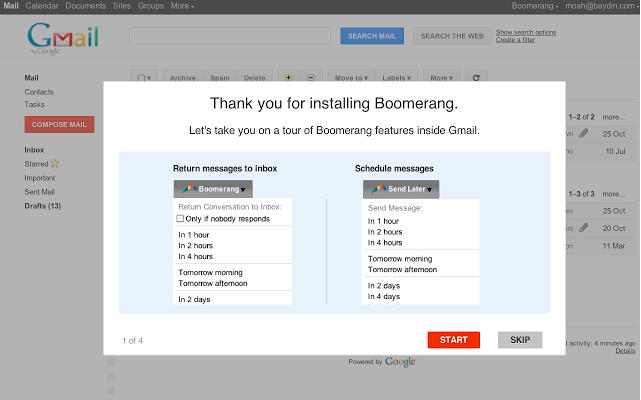 Which brings us to the Boomerang, a Gmail app that has basically increased the open and reply rate of my emails. 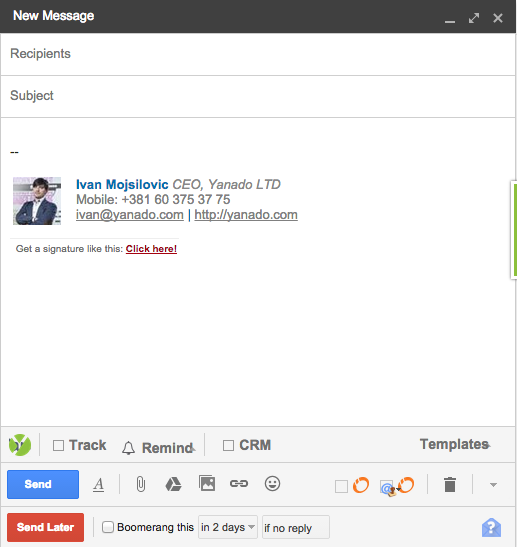 Boomerang essentially makes your emails go out and, wait for it… arrive when you want them to. Scheduling sending and postponing of incoming emails seem to be the basic staples of the app that most of its users love. When important but not urgent emails come in, instead of marking it important and forgetting about it until two days later, you simply click a button and you postpone the email for whenever you assume you’ll have time to get to it. It reappears in your inbox as if it had just arrived. Like hitting the snooze button on incoming email! It’s optimized for mobile and tablets. If you work remotely and/or run around from meeting to meeting like I do all the time, you know how much this means to me. All joking aside, an app as simple and highly functional as Boomerang has really helped me reorganize the way I send and receive emails, making both my short-term memory and response time better by far. I see is that you do have to grant Boomerang access to your emails so that it can work its magic. Then again, this is a common risk we have to take with any app or plug-in these days and the guys who developed Boomerang seem to take security seriously. Other than an abundance of saved time and proper response to emails – Boomerang recently launched an Android app that many have said could actually replace Gmail for Android users. I seriously doubt I’ll be switching from Gmail to anything else entirely any time soon, but I can’t imagine my inbox or outbox without Boomerang anymore.